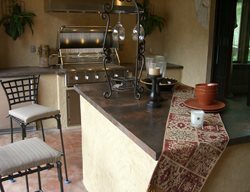 The counters in this outdoor kitchen were cast to have a faux wood pattern. 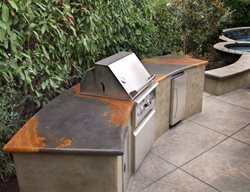 This East Texas outdoor kitchen concrete countertop was designed with 12 gauge shotgun shells on the bullnose edge, acid stained, and poured over with a tabletop epoxy. Project time start to finish in less than 10 days! The shotgun shells were emptied of gunpowder and lead, so they are not live bullets! The home owner was excited about daring his buddies to tap the end of the live rounds and see what happens! This project was done for KJ Homes, Inc. See more personalized concrete countertops. 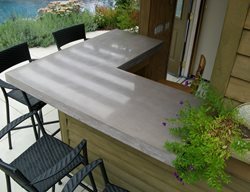 These countertops were built using the Ashby System and Maximizer Lightweight concrete. There was no color added to the concrete integrally. There was some white cementitious color sprinkled in the forms before pouring. After removing the slabs from the forms, black grout was rubbed in the voids created by the Ashby system. Then some rust color and black color were added into the lacquer sealer to create more mottling effects. Lastly, these tops were sealed with a urethane. 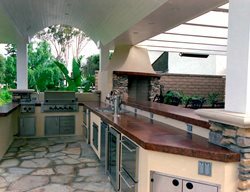 This residential outdoor kitchen/BBQ featuring a concrete countertop was fashioned using the Buddy Rhodes press technique. The colors used in the concrete were sand and vine. The backsplash colored in the vine tone with diamond shaped designs. The cap in the sand tone to match the rock veneer. 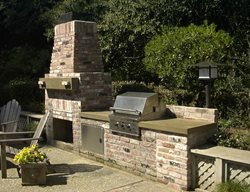 Thomas Design and Construction worked with a local architect to design and build an outdoor barbecue. The cantilever was to be of different finish and color, yet look as though it was sliced right out of the main stock. The knockout for the bbq and side burner both have draining abilities if water was to sneak under a sleeve. The edge of the piece is contoured to match the backside of the patio, slightly arched. The bbq is fully supported by the stainless steel tubing on the left. 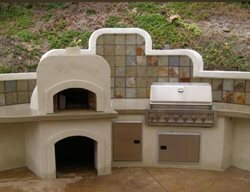 This residential outdoor kitchen features a cast-in-place concrete countertop with an inlayed Italian tile. 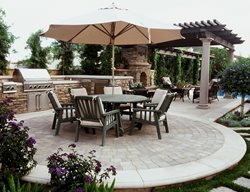 This stylish outdoor barbeque features custom brick work, stamped patio and cast-in-place concrete countertops, wall seats, and wall caps. The countertop features a micro-topping colored in port wine, the wall seats and caps were integrally colored in cream beige. 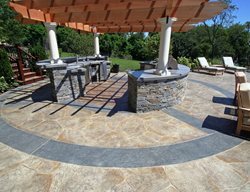 The patio was stamped using a Belgian slate texture and colored with a walnut release. Read more about concrete engraving. 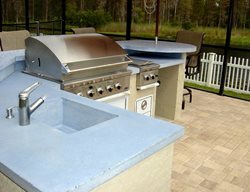 Outdoor kitchen complete with sink, ice-maker and concrete countertops made from Buddy Rhodes mix. 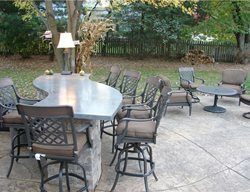 Complete outdoor kitchen with patio cover and concrete countertops to match edging on pool. 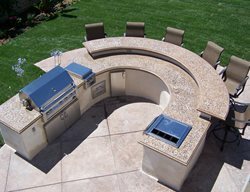 Read about this outdoor kitchen. 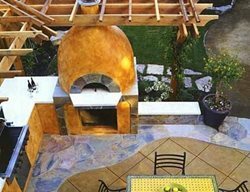 This outdoor custom countertop features hand-seeded glass and aggregate, terra cota colored stain and sandblasted and stained turtles and palm tree images. 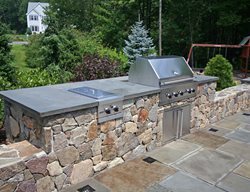 Accent Curbz concrete artisans stone faced this outdoor bbq grill island in a field stone look.